It was a day of Old Paris in New York. 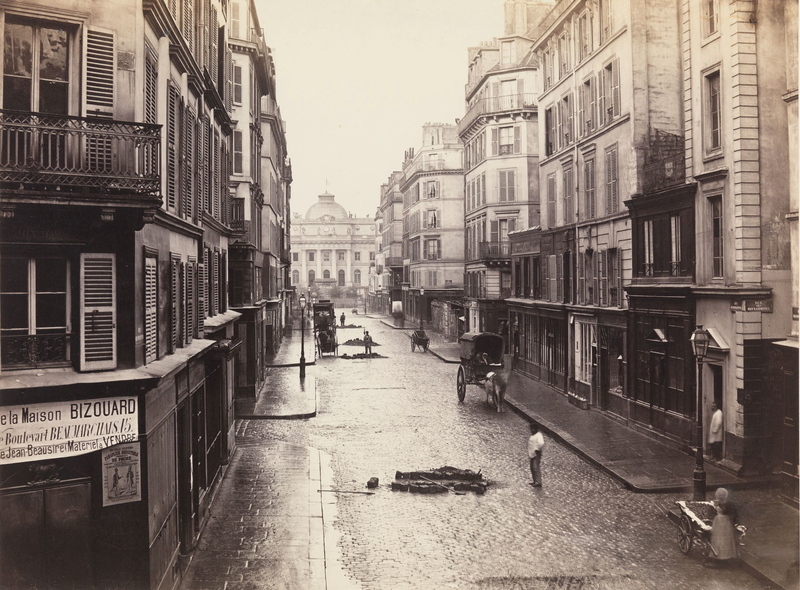 The Metropolitan Museum had an exhibit, Charles Marville: Photographer of Paris, showcasing a Frenchman who was one of the first people to turn a photographic lens on the world, starting in the 1850s. I think the word “evocative” might have been coined to describe Marville’s glass-negative images, with their rain-wet cobblestones and ancient, crumbling Parisian walls. “When good Americans die,” said Oscar Wilde, “they go to Paris.” I was feeling pretty good. with its flour-butter roux… which looks, feels, and tastes for all the world like a creamy soup but can contain as low as zero fat.” The Metropolitan Museum cafeteria is a place where you can eat hoity-toity French soup and eavesdrop as the people around you have erudite conversations about high art. Those speaking English in any case, which was the minority on this polyglot afternoon. The rest of the diners around me, for all I knew, could be discussing race cars or Swahilian TV stars or the price of eggs in Hong Kong. We crowded into the elevator with a handsome, voluble French family who looked like they would be saved from every one of life’s hardships by the cut of their clothes. 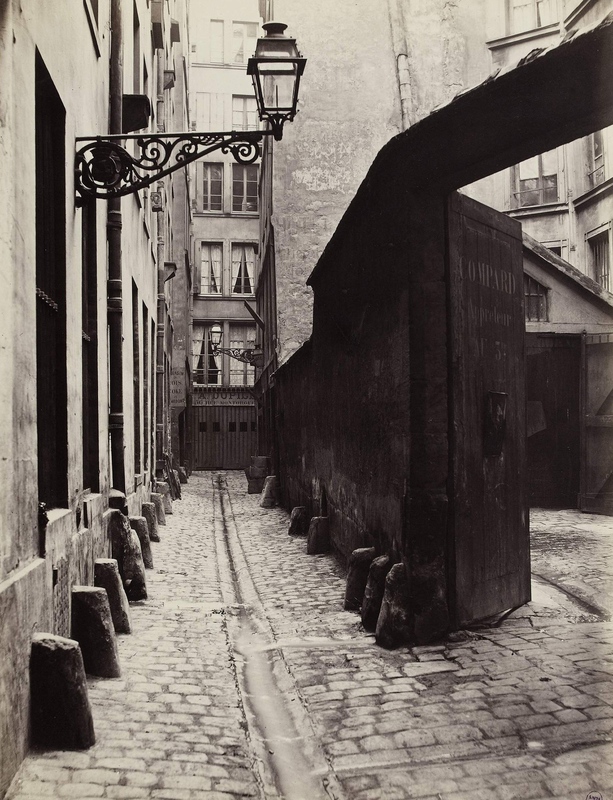 Charles Marville began his career as an illustrator, coming to photography later in life (and early in the life of the medium, as it had only been invented eleven years before he picked up a camera). His early work displayed country scenes and self portraits, like the one of Marville on the bank of the Rhine, hand held up poetically to brow. The cathedrals at Chartres and Rheims offered fertile subjects for his developing eye. I liked the treasures he showed in a tableau at the latter, complete with a mysterious mummified cat. He also did cloud studies, incredibly difficult in an era when everything shot needed a different exposure. Then Marville found his artistic voice. 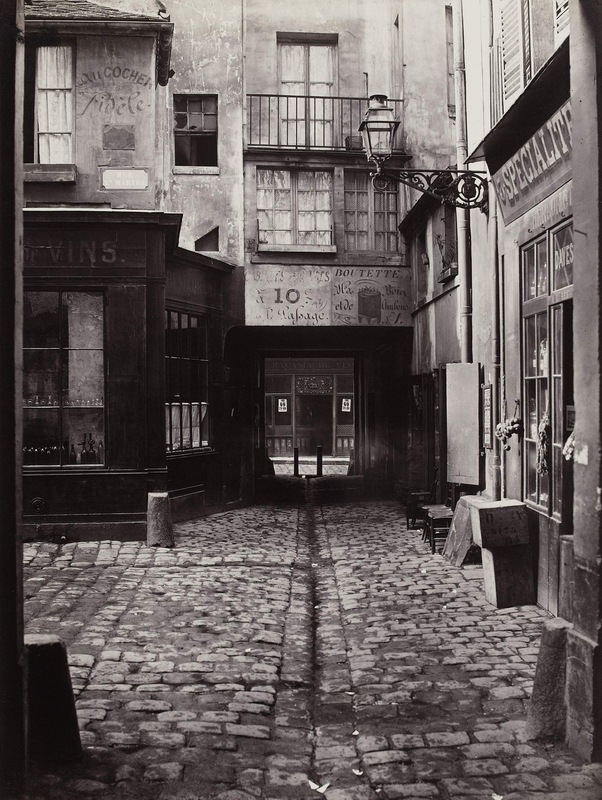 He began depicting the narrow, winding alleyways and lanes of Paris just as Baron Georges-Eugène Haussmann was transforming it with new, grand boulevards and public buildings at the behest of Napolean III. The government encouraged him, too, appointing him the official photographer of the city, with a surprising sense that all this would be going away forever. It was now his job to capture the rapidly disappearing, incredibly textured urban micro-landscapes of the mid-century City of Light. The streets glisten, both with rainwater and the sewage that runs down every gutter. It was a time that was somewhat appalled to see itself speeding pell mell into the future. Le Temps commented about “grand roads vomiting and absorbing torrents of pedestrians and vehicles” on some of the new perfectly paved roads. It is that very contrast that makes this work so poignant, of course. Marville frequently used the motif of a “window” or opening at the back of the picture to lead your eye back. 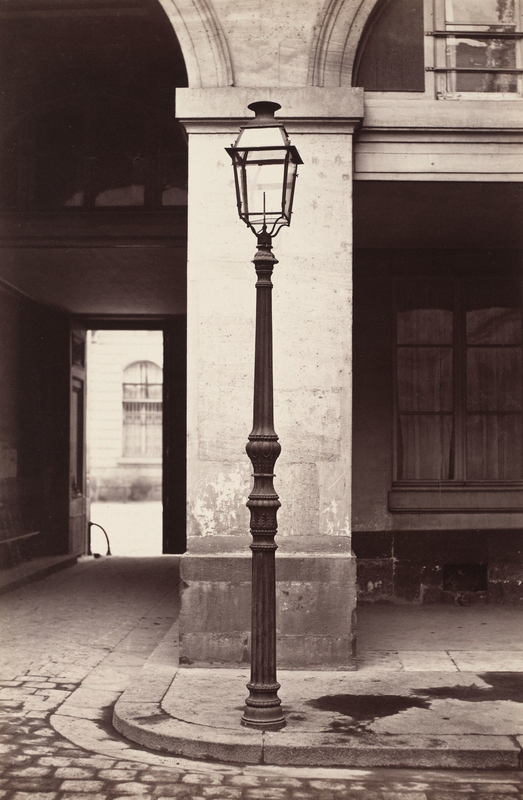 After documenting the streets slated for urban renewal, Marville was assigned to capture for posterity some of the newfangled improvements Haussman had installed. These included two features that were futuristic at the time. Lamposts. There now stood some 20,000 gas street lamps where before there were none. Marville photographed dozens of them. Called vespasiennes, the name derived from that of the Roman Emperor Vespasian, who supposedly imposed a tax on urine, these represented the ultimate novelty, private (relatively) and sanitary (relatively) and lit by those same spiffy gas lamps. 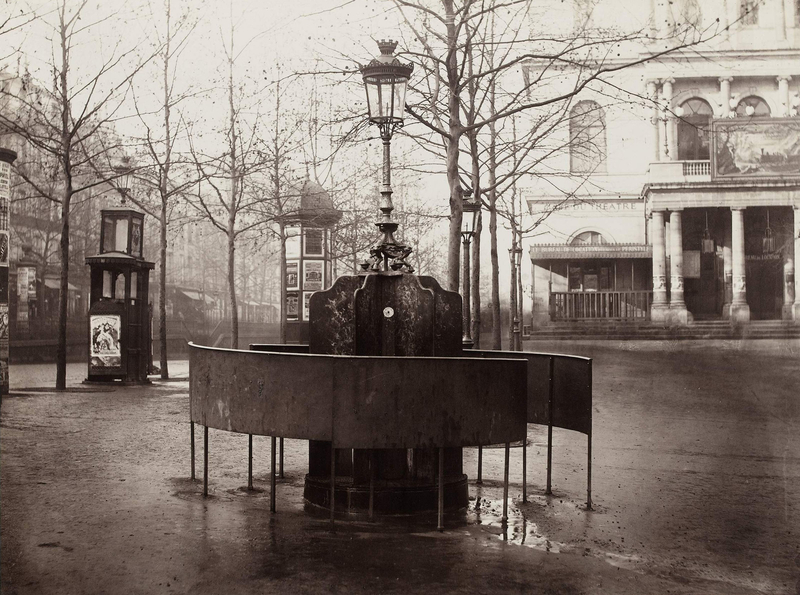 The vespasiennes seemed antiquated when they were decommissioned at the end of the 20th century, but in 1860 it was like a spaceship-pissoir had touched down. “A walk about Paris will provide lessons in history, beauty, and in the point of life.” So wrote Thomas Jefferson. At the exhibit I saw a photo with a heavy brown velvet flap hung down over the front due to the image’s sensitivity to light. There was a line of people crowding up at any one time to lift the curtain and see the magic underneath. It was a nice picture. But I felt that the magic was equally contained in each of the poetic photos around the gallery, impervious to time. Hadn’t read it but thanks, I liked it. Enjoy The Painted Girls, I thought it was so good.